The wide range of cultures that inhabited North America before European settlement produced beautiful artwork and ceremonial objects that still grip the imagination today. We carry a wide selection of Northwest Coast Indians art, Navajo jewelry, and Native American masks that reflect the cultural heritage of these proud peoples. From spirit figures to necklace pendants, our native North American artworks are treasures that you can bring into your home. The Pacific Coast inspired its native peoples with soaring hills and rolling waves. 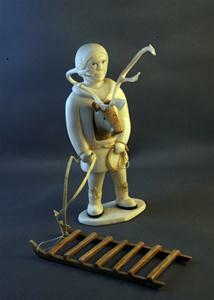 Our selection of Northwest Coast Indians art includes ivory carvings of people and the animals they hunted. Native American masks from the Northwest Coast embrace the spirits of nature from Canada and Alaska. Our Navajo jewelry includes animal-inspired pins and beautiful necklaces. Whether you’re looking for a conversation piece, artwork that represents your heritage, or an item that simply “speaks” to you, we’ve got the North American art for you. Discover the charm and beauty of Native American artwork at Spectrum Arts Gallery.